Breville, Sunbeam or something better? Thread: Breville, Sunbeam or something better? Looking to buy a low-midrange coffee machine for home. Less than $400 preferably. We have a cheap Sunbeam at work that is pretty reliable, doesn't do an amazing job obviously. I'm looking at getting a Breville for home, maybe the Breville 800 model. What are your guys' thoughts on that? Mainly using for espresso, machiatto and the occasional latte. What are your opinions on the DeLonghi machines, specifically the ECO310? Have you considered a second hand machine? For $400 you may get something brand new that will do a similar job to what you already have. If you however look at something second hand you could get your hands on something like a Rancilio Silvia. I only say maybe. On top of this like most will suggest on here is that you will need to consider a grinder as well. You can by a great machine, however if you only by a cheaper grinder or use ground coffee you cant really expect to much. A grinder is more important. next thing is a on-demand conical burr grinder. minimum will be a sunbeam em0450? Barry O'Speedwagon and chokkidog like this. Where would I find single walled baskets? It looks like I might go for a nice grinder (any recommendations around the $200 mark?) and a cheap Sunbeam/Breville machine until I can get my hands on a really nice piece of equipment. And also, what would higher quality espresso machines should I look for down the line? The Rancilio Silvia? Any other recommendations? Most SB machines, even on gumtree/ebay will come with both double and single floor baskets. Or check on ebay for parts. What coffee do you like or expect to be making? If milk varieties in any number (i.e. other than once every so often) look for double boiler or double thermoblocks - the steps involved in getting a single boiler to perform for both coffee AND steam will get old very fast. The SB twin thermoblock and Breville double boiler have a much simpler use and the SB can keep producing coffees for a houseful of drinkers. The most I have done at one time was 7 and the last coffee was as good as the first. Machines with single or small boilers have to keep waiting for the boiler to refill or build up pressure after each use - thermoblocks just keep pumping through the water and steam - it's like using a pro machine and producing coffee and milk simultaneously. If the SB at work isn't producing good coffee it's because it isn't being used or maintained properly. Or people haven't learned to make coffee properly - there's more to it on any machine than cramming coffee into a basket and running water through it. My SB (and those of many others on here) produces excellent coffee, very simply and reliably. I haven't used the Breville range but there are threads here dedicated to them so have a read. I'd recommend the SB EM6910 along with some reading on CS to see what process to use and for tips on getting the best from it. For a start they are a lot less to buy than the Brevilles which leaves more for the grinder. If you're buying online, try to make sure you get to see the machine in action, or maybe pay by Paypal so if it is non-functional you can get your money back. You will often see the 2nd hand SB's come with the grinder so maybe look for one of those deals. e.g. a fairly new 6910 and 480 were sold on ebay 2 days ago for $305 along with all you'd need except beans. out of curiosity, what sunbeam are you using at the moment? Using Sunbeam Cafe Espresso at the moment - there's not too much we can tinker with on it, it's a pretty basic unit. I like espresso's, will make the odd cappuccino or machiatto with it as well, but definitely won't be making multiple milk coffees. 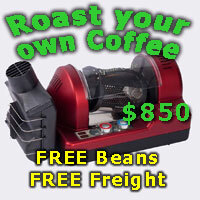 I see there are some deals for the EM6910 espresso machine + EM0440 grinder at around $450-$500 brand new. Do you think this would be a good starting point? I'd talk to them about upgrading the 440 to a 480. Better grinder for very little more. With the 480 it would be a good starting point and there's a lot of info on CS re using them. If it's mainly espressos, the issues re single boiler machines may not be a concern for you. To me the idea of following the necessary rigmarole for virtually every coffee is a definite deal breaker but mostly the missus and I (& friends) drink milk-type coffees. Should I go for the CC45?? if the work machine is the sunbeam cafe creme II I had that & replaced it (after 3000 cups) with the breville 800 today. it makes coffee from beans and to me even the shittest machine is better than a jug & international roast.just a bit easier to use than the 'beam really push buttons nice handle to turn front load water I can see the first cup being an easier proposition now. The Gino is a commercial grinder - to be that price you'd have to ask what is wrong with it. Buying it cheap may not be so once you've paid for worn parts etc. Also I think it's a doser - most CS'ers seem to prefer doserless - wastes less coffee. I'd probably go the brand new one - at least there's a warranty with it. If you don't mind me asking, but where did you find this?! id head towards the 6910 if i were in your position. like journeyman said, the 480 is a big step up from the 450 for only a little more. maybe if you can find somewhere that sells the 6910 with 480 within your budget? or settle for a second hand set? How is a 480 a big step up from a 450? do you think a 1-2 year old 6910 will be reliable? would you guys go the 6910 over the breville 800 series? The Gino Rossi CC45 is a well built commercial grinder and will last longer than any of the appliance grinders. New they retail for $700 plus. There are a tonne of them out in the wild and you can pick up really good ones for between $300-400 with minimal wear and still looking good. I picked up a RR65 without a hopper for $250 and it has never missed a beat. I use it for plunger and pourover duties now, though it worked great for espresso for a couple of years. It was from a restaurant that closed down and has seen some wear. The Burrs did not need changing. Condition overall was fair. To me it was a bargain. If the one for $150 works, and looks ok, then I would buy that over any other grinder. Second hand they represent the best value on the market for a grinder as they are a commercial unit, built to last. Doser or doserless is irrelevant if you are on a budget and want value for money. You want a unit that can grind coffee. A few sweeps with a brush and a dosing chamber is clean. It is all about technique. Any comments about new grinders $500 and under, being superior to a 2nd hand working GR are just internet speculation. I have used these grinders and so have many others. They are good units and highly under rated. Main disadvantage is their size, when it comes to home use. In the coffee scene, you will be surprised how may units are still being used in low volume venues. There might be some extra costs involved with replacing some pieces (it is a fairly well-used model from an ex-cafe), so if I can get the grinder to me for under $200, I might go ahead with that! Have you thought of lelit combi? I just purchased one and it looks like a well built machine with built in grinder (of decent quality). This is my first real machine, coming from nespresso and i only made two cups so far and both were pretty decent, and it can only get better. The one i got is an older model and it cost me 685 including courier shipping. Very happy with the purchase. the 480 has an overall sturdier construction with much more metal bits than plastic and also has more grind settings. TBH i havent really played with the 450, but from using the 480, it seems to be at the bare minimum i would put up with - so by extrapolation i personally would shy away from the 450.
i see your point on being just a small step vs a big one, but considering longevity i'm very weary of the 450 and have seen many posts here on the 480 lasting years of use. Only differences between the 450 and 480 are cosmetic. Same burrs, carriers, even grind settings. The metal bits on the 480 are cosmetic only. My 450 and current-use 480 are both very good machines. Apart from the shim issue, the other thing I found with another 480 I have is the spindle has side play. I'm planning on doing Ray_C's adjustments to it to see if I can make a decent grinder out of it - grinds OK for now but both the others do a better job by taste in the cup. And both the others have zero play in the spindle - not sure why the other one has it yet. But yes, they are very similar machines and parts seem interchangeable. There is a switch on the side of the 480's that I find useful - I prefer the 2-handed operation using the side switch although both machines have the PF-push switch - it's a decent alternative particularly when using the PF holder that clips onto them. I take those off as my preference is more 'hands-on' so to speak.